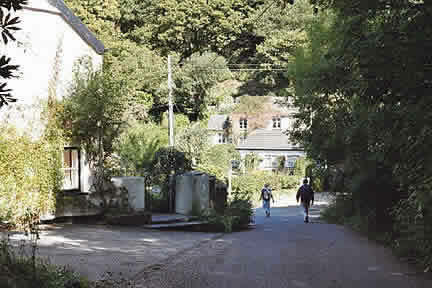 Bucks Mills is another picturesque haven on the North Devon Heritage Coast. It is easy to find on the A39 Atlantic Highway. If you are travelling from the Bude direction it's the first turning on the left just past the Bideford Bay Holiday Park or turn right at the Buck Cross Post Office if you are coming from Bideford. Unlike Peppercombe you can drive most of the way down. It's a long and winding road down through the valley. On the way you will find St. Anne's Church on the left hand side, just before the Church there is a car park cut into the hillside so visitors can take a closer look at this pretty little Church which was built in 1862. It was endowed to the village by Mrs. Elwes, the Lord of the Manor of Walland Cary. The village is divided by the stream which once used to power the old corn mill and marks the boundary between Parkham and Woolfardisworthy Parishes. Before the consecration of this church, the coffins of those who died had to be taken to Parkham or if the deceased lived on the other side of the village, were carried along the "Coffin Road" which is now a public footpath. (The illustrated Map at the entrance to the car park shows this in detail and also gives a brief history of Bucks Mills and how the name evolved). As you travel down passed the church you will see the entrance to Bucks Woods on the right hand side. The wide clearing through the gate is bathed in sunlight on a sunny day in sharp contrast to the lane which is bordered by the dense woodland and is therefore in deep shadow. You can stop here a while and take a walk through the woods or carry on down, the visitors' car park is on the right. There is nowhere to park in the village so you must leave your car here and walk the rest of the way. It's a pleasant stroll down passing some very picturesque cottages. As you go through the village what was once the "Temperance Hotel" is on the left. Up until recently, in the summer months, there was a café and shop open here. It closed a while ago so make sure you take a picnic. At weekends, between June and August you can now enjoy a real DEVON CREAM TEA at St. Anne's Church. Next door to the "Temperance Hotel" stood the "Corn Mill" which was powered by the stream. Seasoned walkers can join the South West Coast Path either to Clovelly or to Peppercombe/Westward Ho!. Straight ahead is the path down to the beach. 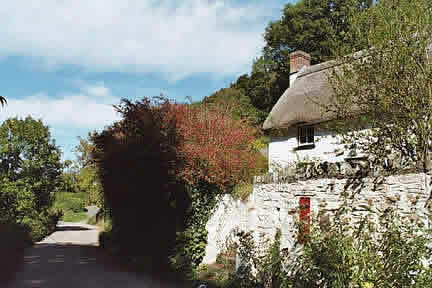 The last cottage, high above the cliff was King Cottage which was once the home of the "King of Bucks", Captain James Braund. The name Braund is most synonymous with Bucks Mills and we have included a special focus on the "Braund Society". Names also associated with Bucks Mills are Bagelhole, Davey and Saunders. In addition the Pine Coffin family of Portledge were, for many years, landlords of most of the cottages and land on the eastern side of the village including the lime-kiln "East Kiln". These were sold at Public Auction on 30th June 1982. The Walland Carey estates were to the west. Most of the cottages, many of which are now private dwellings or holiday homes, were built around 1812 to 1835 to house estate farm workers. What was once the manor house for the Walland Carey Estate is now the club house for the Bideford Bay Holiday Park. Historical Information - D. Hubbard-Fielder, The Story of Bucks Mills & Bucks Cross, available from Bideford Library and information supplied by the Braund Society.